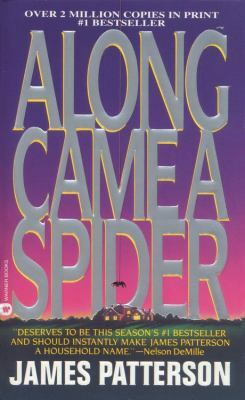 ALONG CAME A SPIDER begins with the double kidnapping of the daughter of a famous Hollywood actress and the young son of the secretary of the treasury. And that's only the beginning! Gary Soneji is a murderous serial kidnapper who wants to commit the crime of the century. Alex Cross is the brilliant homicide detective pitted against him. Jezzie Flanagan is the female supervisor of the Secret Service who completes one of the most unusual suspense triangles in any thriller you have ever read. Used Good (1 available) Former Library book. Shows some signs of wear, and may have some markings on the inside. 100% Money Back Guarantee. Shipped to over one million happy customers. Your purchase benefits world literacy! Used Good (2 available) Shows some signs of wear, and may have some markings on the inside. 100% Money Back Guarantee. Shipped to over one million happy customers. Your purchase benefits world literacy! Used Good (8 available) Shows some signs of wear, and may have some markings on the inside. 100% Money Back Guarantee. Shipped to over one million happy customers. Your purchase benefits world literacy! Used Good (3 available) Shows some signs of wear, and may have some markings on the inside. 100% Money Back Guarantee. Your purchase also supports literacy charities. Used Acceptable (1 available) Former Library book. Shows definite wear, and perhaps considerable marking on inside. 100% Money Back Guarantee. Your purchase also supports literacy charities.